The simplest of these methods is to gain, and hold onto, prestige points. If you can stay on top until the end of the game then victory is yours. However, curing the King, or becoming corrupted yourself can cut the game short. Straight away developers League of Geeks has struck upon one of the key great design concepts in any board game; multiple paths to victory. Even if you concentrate on collecting prestige, it can be achieved in a number of ways, from killing the dark banes, rot infested beast that wander the land, to completing quests. You can also kill your opponents, not only gaining you a point of prestige but forcing them to lose their all-important points. 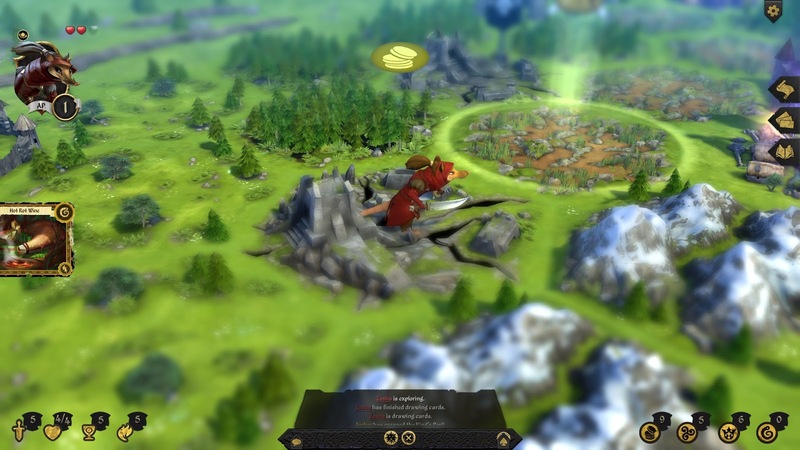 Questing is the main thrust of the game, as not only does it gain you prestige it also allows you to increase your statistics and to quest you’re going to have to explore the beautifully rendered world or Armello. This is one of the game’s main selling points, you can have amazing board game components like those in Imperial Assault but it’s not going to come with the animations, music and little touches that a videogame can create. From the wind blowing, to seagulls flying overhead, Armello is full of tiny little touches that take it far beyond the simple hex based board that it actually is. Each day, separated into two day and night turns, you’ll explore the world of Armello, completing quests, killing banes and hopefully gaining more equipment, stats and prestige. Again Armello takes the design choice of a really great board game and limits your actions in such a way that you can never achieve everything you want in a single turn, you’ll either run out of movement or get stopped by a bane. It can often lead to some frustrating turns, but that limitation is often a good thing, forcing you to carefully think about your move. What isn’t a good thing is the down time. Just like any table top board game there is always going to be downtime as your opponents take their turn, which unfortunately in Armello is bloody frustrating. It’s really bad when your turn is mostly made up of trying to cross the map but when you then have to sit through three other player’s turns, the king’s guard and the banes, as well as the end of turn actions, it can get a bit trying. In a multi-player game this is a mild annoyance, other people are actually having their turns but when playing against the AI you sometimes feel as if the majority of the game is a spectator sport. I failed to mention so far one of the key mechanics of the game, cards. At the start of each round you fill your hand with your selection of item, magic and trickery cards, each one an absolute beauty to behold, not only because of the amazing artwork but because each card is also animated, something we won’t be seeing in board games for some time I imagine. Each card has its written effect, with your typical boons for you and hindrances for your opponent. Using a card requires the spending of the one of the many resources in the game but if you’re out of money or magic, or are just looking for the edge, they can be used in combat or when facing perils. Combat is a rather simple dice off affair, roll your pool of attack dice and score more hits than your opponent can roll defence. There some nice additions; such as sun and moon dice symbols only grant a bonus whether its day or night, trees provide extra dice to roll and of course any equipped item usually adds dice to your pool. The clever concept though is how you can burn a card to turn one of your dice into the symbol on the card. They don’t give you an extra dice but give you greater control over your fate, therefore increasing in those tactical options that make a game interesting. Facing off against even a slightly powered up opponent usually results in instant death for your character, losing you a point of prestige and sending you home. If you’ve not managed to tool yourself up or are not avoiding fights then at about hallway through a game of Armello the game grinds to a frustrating halt as you attempt to complete your quest on the opposite side of the ‘board’ but can’t get there because you keep getting attacked by blight infested crow monsters who kill you as soon as you get near them. One of the big selling points for Armello was the implication that this game couldn’t be played on the table top as it is just too complicated. The story goes that the developers play tested the game with cardboard and dice and required two games masters to manage all the things going on outside of the players’ control. But I just don’t see it; this game appears to be around half as complicated as a standard game of Arkham Horror with expansion. It may be there are a lot of things happening in the background that I’m just not seeing but if so that makes things even worse. What is happening in the background and how is it affecting my game? That being said, it doesn’t affect my enjoyment of the game one bit, I think you could play a table top version of this game but you would lose out on the absolutely beautiful graphics, animation and ambience. At first Armello is absolutely brutal. Because of the various ways you can advance and the crippling penalty of death, it can feel that the game is picking on you and is just nasty. But after a few games, you get the hang of what Armello is about and how to play. Yes, combat is deadly but that should be used to your advantage, either avoiding combat if you’re a vulnerable character or hunting down weaker players to gain prestige. Wits and magic can be improved to weaken your opponents or sneak behind them to gain quests or plunder dungeons. 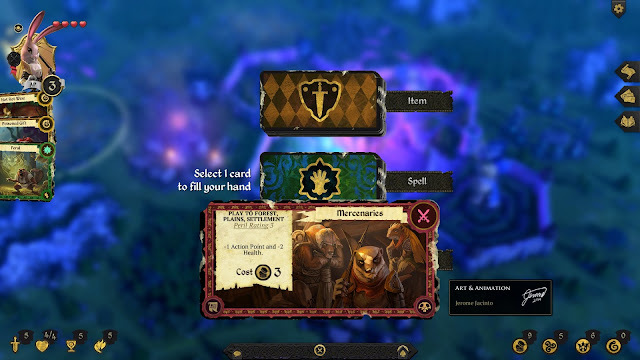 In a weird way Armello bears more than a passing resemblance to The Witcher Adventure Board Game, both have a similar ‘get to X’ aspect to their quests and both games use very similar dice mechanics to resolve conflict. Appearance wise they bear absolutely no relation but their underlining characteristics are the same. 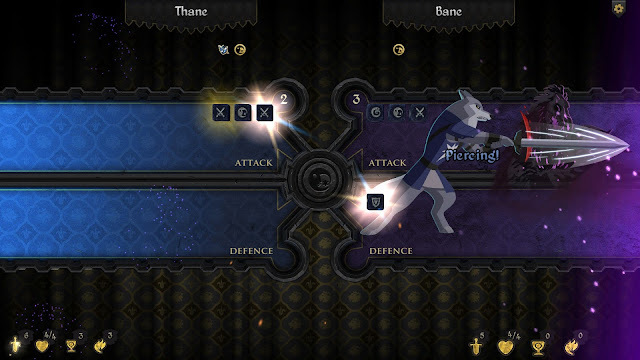 However, Armello has direct player against player conflict, something The Witcher was missing. 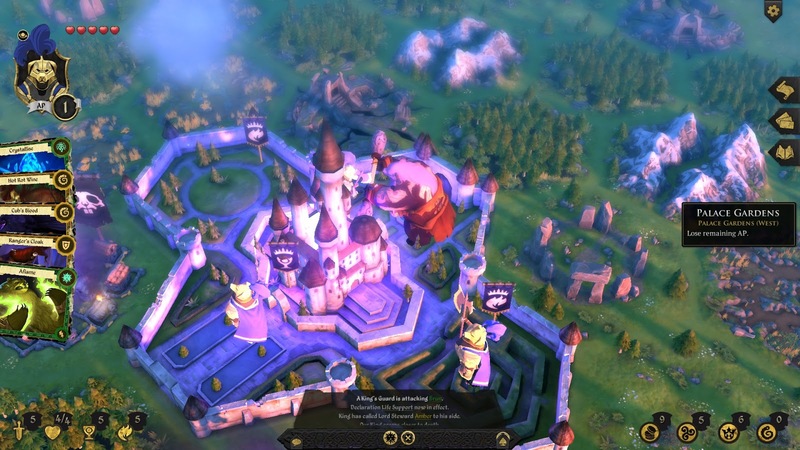 If you can get past the initial difficulty, and get your head round the concept of the game, there is a lot to reward you in Armello. 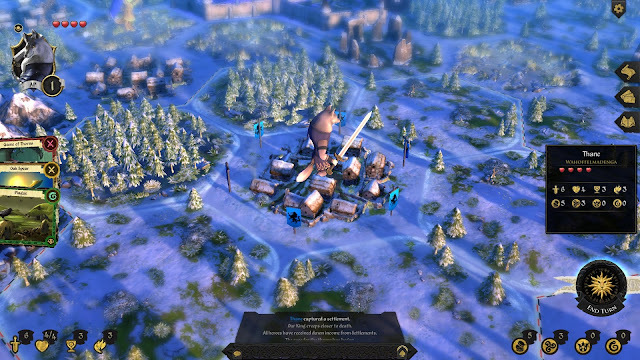 Its graphical fidelity is astounding but there is a solid game behind those impressive looking pixels to back it up. The question is, does Armello stand up to some of your board game favourites? I believe the answer is yes. 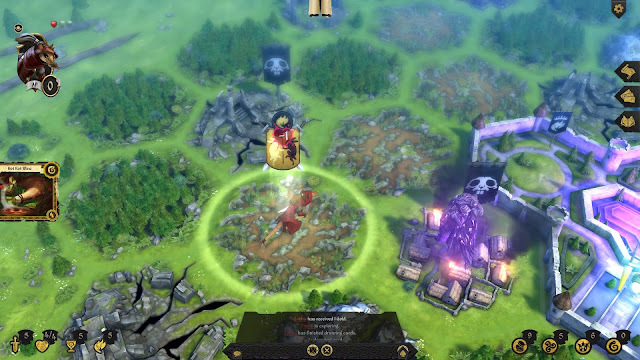 The game may be towards the more thematic end of the spectrum, but Armello has asymmetric player powers, multiple paths to victory, throwing buckets of (digital) dice and numerous ways to achieve your goal, all the hallmarks of a great board game.